I like going to concerts, especially when they are organized in Antwerp. In contrast to other big concert halls, Trix is like Antwerp; small but with a big attitude! Besides rehearsal rooms and a recording studio, there is Trix Café and Trix Club. More than 100 volunteers help during the concerts and workshops to make you feel welcome and well-treated. 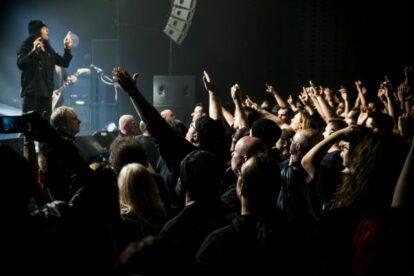 Hip hop, metal, indie rock, electro, you name it and you can attend a live concert of your choice throughout the whole year. I prefer going to Trix Café, it’s a bit smaller and cosier than the club and mostly there is enough place to dance and as big an audience as necessary to make it wonderful. Every 3rd Thursday of the month you can go to TrixTrax: free concerts by young talented bands, artists or DJs. You might just see a band for free just before its breakthrough – think of School is Cool, Oscar & The Wolf and Intergalactic Lovers, just to name a few. Check the website or Facebook for upcoming events, you won’t regret it!